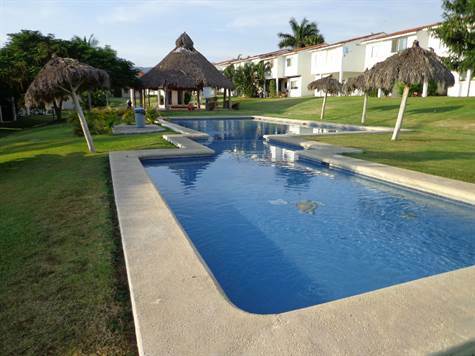 PPR : 2 Story For Sale in Vista Pelicanos Sales, Rentals, Mortgages, Insurance and more. Your one stop shop. Great community in La Cruz. • 110 sq. m., 3 bath, 3 bdrm 2 story - $127,800 - REDUCED BIG TIME! Vista Pelicanos, La Cruz De Huanacaxtle - BEAUTIFUL HOUSE IN A PRIVATE COMPLEX, WITH EXTRA AREA AT THE BACK HOUSE. 1 BLOCK TO THE BEACH IN LA CRUZ DE HUANACAXTLE. CONVENIENCES (STORES, RESTAURANTS, BEACH, MARINA ETC) ALL WITHIN WALKING DISTANCE. DONT MISS OUT ON THIS OPPORTUNITY. WONDERFUL COMMUNINTY POOL WITH PALAPA FOR ENTERTAINING, BBQ ETC. PLAY GROUND WITH PLAY STRUCTURES FOR CHILDREN. HERMOSA CASA EN COTO PRIVADO CON AREA EXTRA EN LA PARTE TRASERA DEL JARDIN 2 PISOS A SOLO 1 CUADRA DE LA PLAYA EN LA CRUZ DE HUANACAXTLE SEGURIDAD Y CONFORT.